Many barriers are facing the selection and development of quality e-content in developing countries, particularly in the Arab region. Many of these barriers could be avoided through rapid e-learning development networks that easily encourage educators to create and share quality e-content themselves. Research highlighted the importance of considering the potential possibilities that online videos present when deciding how to support recent e-learning communities. Watching video is considered as a basis for mental activity. It is socially acceptable and widely used and supported by multimedia cell phones and portable media players. Video can add interest and engagement to e-Learning and training strategy deliveries. PresentationTube, a non-profit and research-based project, and one of the winners of the Internet Society Community Grant 2013, offers a video presentation recorder and video sharing network to help teachers and learners in Oman produce and share quality video presentations in a new and effective way. The recorder accommodates the technical differences among teachers, as well as the requirements of producing video materials for learners. The recorder automates the process and ensures that teachers only need minimal technical knowledge and spend no additional time creating materials. The recorder allows teachers to synchronize a variety of visual aids, including presenter’s audio and video footage, PowerPoint slides, text, drawings, and web content. With visual aids, like the drawing board, the teacher can draw lines, curves, graphs, and shapes on the screen to emphasize or clarify their ideas, so the demonstration can be clearer. The whiteboard helps the teacher to type text while presenting using the keyboard making it an ideal tool to add more details, or explain equations using words, numbers, and symbols. The video sharing network involves the learners via scrollable slide thumbnails and discussions, with unlimited video uploading and delivery. The network integrates many interactive features, such as Facebook social plug-in and the slide-thumbnail, allowing the learner to move to the respective video content and control both the time and progress of video presentation. Learners can play, rewind, forward, and pause the video to address their specific needs. 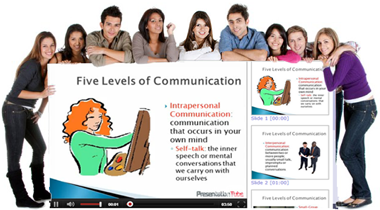 PresentationTube can be used in Oman in various e-learning settings to provide more realistic experience, encourage interactions between learners and the teacher, and create engagement. The quality of PresentationTube video presentations is controlled by experts in subject matters and accessible via any operating system, standard browser, or mobile device. This week commenced 1st September 2013, around 200 Omani teachers started to receive training on producing effective PowerPoint presentations for PresentationTube video presentations in various subject matters around the country. More than 10 IT teachers and learning resources specialists, who graduated from the Department of Instructional & Learning Technology, College of Education, Sultan Qaboos University are expected to participated in training and supporting teachers In Muscat, Salalah, Al Batna, and AlSarquya cities and regions. Teachers already downloaded the presentation recorder and started to narrate, record and upload their presentations to PresentationTube Project. Just few days after starting the PresentationTube project, the team received good news from the World Summit Award Committee that PresentationTube is one of the 5 WSA Winners 2013. The project has been selected by the WSA Grand Jury as best and most innovative in e-Content 2013 in the category e-Learning & Science.